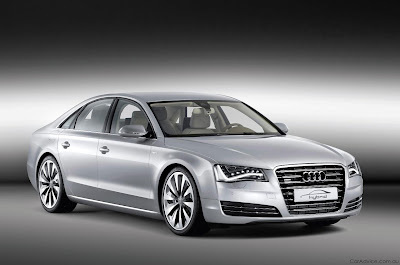 The power of a six-cylinder model, the fuel consumption of a four-cylinder version: Audi will be starting series production of the A8 hybrid in 2012. Its gasoline engine – a 2.0 TFSI – and an electric motor develop peak output of 180 kW (245 hp) and 480 Nm (345.03 lb-ft) of torque. Average fuel consumption is below 6.4 liters per 100 km (36.75 US mpg). The sedan can travel at speeds of up to 100 km/h (62.14 mph) on electric power alone, and cover around three kilometers (1.86 miles) with zero local emissions at a constant speed of 60 km/h (37.28 mph). The Audi flagship model is designed as a highly efficient parallel hybrid. The 2.0 TFSI, which has been modified in some areas, generates an output of 155 kW (211 hp) and 350 Nm (258.15 lb-ft) of torque, which is available between 1,500 and 4,200 rpm. The combustion engine works together with a disc-shaped electric motor which develops 40 kW (54 hp) and 210 Nm (154.89 lb-ft). The permanent magnet synchronous motor is mounted in the space usually occupied by the torque converter in front of the modified eight-speed tiptronic. A multi-plate clutch that operates in an oil bath connects or disconnects the electric motor and the TFSI engine. The clutch operates ultra-precisely and gently in all situations. The highly comfortable and fast-shifting hybrid transmission guides the torque to the front wheels; with its wide gear spread it contributes to the efficiency of the Audi A8 hybrid. The short-term system output of 180 kW (245 hp) and the system torque of 480 Nm (354.03 lb-ft) ensure highly agile performance. The Audi A8 hybrid reaches 100 km/h (62.14 mph) in 7.7 seconds from a standing start and has a top speed of 235 km/h (146.02 mph). Its fuel consumption in the EU cycle is less than 6.4 liters per 100 km (36.75 US mpg), and CO2 emissions are below 148 grams per km (238.18 g/mile). Please note that all figures are provisional. The Audi A8 hybrid can drive at up to 100 km/h (62.14 mph) purely on electric power and has a range of up to three kilometers (1.86 miles) at a constant 60 km/h (37.28 mph). This gives the driver the choice of three modes: The EV characteristic map gives priority to the electric drive, while the D mode efficiently controls both the engine and the electric motor. The S mode and the tiptronic gate are designed for a sporty driving style. The hybrid sedan has five operating states: with the TFSI engine alone, with electric drive only or in hybrid mode; recuperation and boosting are also possible. Two displays show the driver all operating modes in detail. The lithium-ion battery, which weighs 36.7 kilograms (80.91 lb), is located in a crash-proof area in the trunk. It provides 1.3 kWh of nominal energy and up to 40 kW of power. Two different methods are used to air-cool the battery, depending on need: with air blown from the passenger compartment by a fan and via a separate cooling circuit coupled to the automatic air conditioning system. The battery is thus kept within the temperature window required for it to perform to its full potential over a wide range. The electric motor and the compact power electronics which serve as a controller between the electric motor and the battery are water-cooled. In visual terms, the Audi A8 hybrid is distinguished by subtle details. The ten spokes of its alloy wheels – which have a diameter of 18 inches as standard and 19 inches as an option – are reminiscent of turbine blades. The body features hybrid badges, and Arctic Silver is available as an exclusive paint finish. The metallic paint finish, three-zone automatic air conditioning, LED headlights and the BOSE sound system come standard. Thanks to the brand’s ultra-lightweight construction expertise, the Audi A8 hybrid will be one of the lightest sedans in its category. Its ASF (Audi Space Frame) body is made entirely of aluminum, while the B-pillars are of hot-shaped, ultra-high-strength steel. Weighing just 231 kilograms (509.27 lb), it is roughly 40 percent lighter than a comparable steel construction.